ZHAO Fangying, GAO Xiuqiu, LIU Zifeng. Effect and Mechanism of Wnt3a on Osteogenic Differentiation of Human Bone Marrow Mesenchymal Stem Cells[J]. 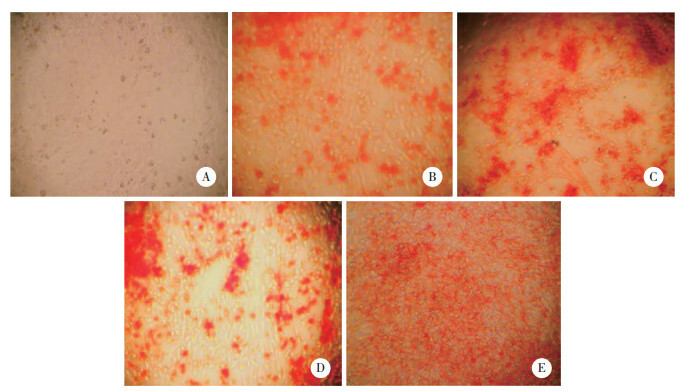 Journal of China Medical University, 2018, 47(7): 617-621. Abstract: Objective To investigate the effect of Wnt3a on the osteogenic differentiation of human bone marrow mesenchymal stem cells and the Wnt/β-catenin signaling pathway. 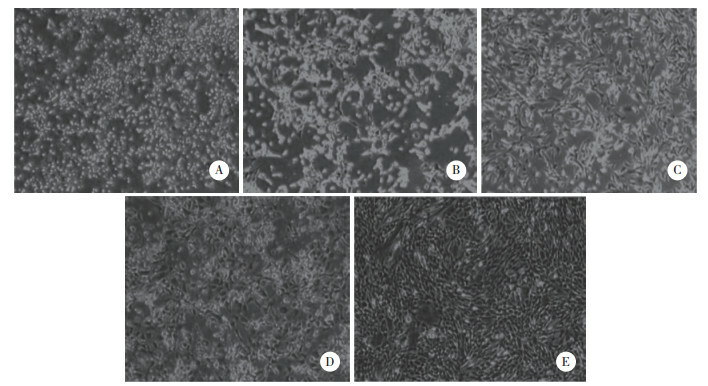 Methods We induced the differentiation of human bone marrow mesenchymal stem cells using an osteogenic induction medium supplemented with the Wnt3a protein (10 ng/mL) to evaluate its osteogenic differentiation by microscopic morphology and alizarin red staining. Real-time PCR and Western blotting were used to detect the expression of Runt-related transcription factor 2 (RUNX2), β-catenin, and bone sialoprotein (BSP) on day 1, 5, 10, 15, and 20 after treatment with Wnt3a. Results Mesenchymal stem cell differentiation into osteoblasts was significantly increased by Wnt3a compared with that of the control group. Moreover, Wnt3a increased the expression of RUNX2, β-catenin, and BSP (P < 0.05), levels of which reached a peak at day 10 after treatment with Wnt3a. Conclusion Wnt3a participated in and regulated the osteogenic differentiation of human bone marrow mesenchymal stem cells by activating the Wnt/β-catenin signaling pathway. DENYSENKO T, ANNOVAZZI L, CASSONI P, et al. WNT/β-catenin signaling pathway and downstream modulators in low-and high-grade glioma[J]. Cancer Genomics Proteomics, 2016, 13(1): 31-45.